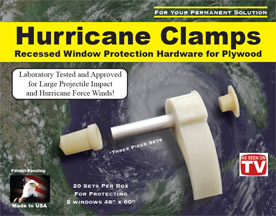 American Hurricane Panels, Inc. presents the EAGLE CLAMP. This great new product is just being introduced. Engineered and fully tested, this is the answer to: ECONOMICAL HURRICANE WINDOW PROTECTION. Don't wait for the weather forecasters to start drawing the path of the next Hurricane. Install this system now while you have time. Re-installation only takes a few minutes per window. Need help with installation? American Hurricane Panels can help. Our Clamp offers a Permanent Solution when using Plywood which meets the State of Florida’s Rigid Testing Standards! Our 43% Glass Filled Nylon is so strong that it held the weight of a Ford F150 for 12 hours without any distortion to clamp. Each kit contains enough clamps to do 5 windows! 20 Clamps, 20 Sleeves & 20 caps, enough to do five average sized windows approximately 48 x 60 windows! Hurricanes are not going to go away, that's why you need this effective system! Don't spend thousands on elaborate systems. 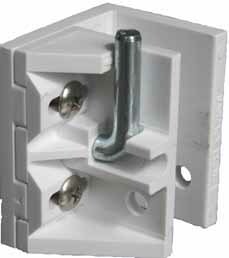 Clamps are Test Approved with Plywood and work with Polypropylene and most other flat Plastic Materials as well. 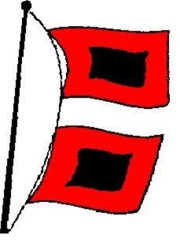 Disclaimer: American Hurricane Panels is not responsible for any collateral damages that may incur to the home due to either misuse of the product or from any unforeseen or natural occurrence or any other act of God. Copyright © 2007 American Hurricane Panels Inc. All Rights Reserved. Site designed and managed by Profit Gate Inc.